Model of Nasal Aspergillosis in Rabbits - Comparative Biosciences, Inc. 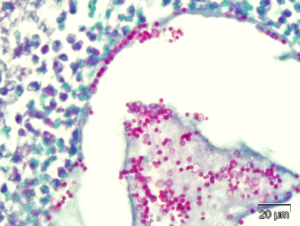 Chronic invasive fungal rhinosinusitis (Aspergillus fumigatus) may occur in subtle immunosuppression as seen in diabetes, corticosteroid use and human immunodeficiency virus infection as well as in patients without obvious immune defects. This condition may present as either an invasive or noninvasive form based on the histopathological findings of the invaded tissue. 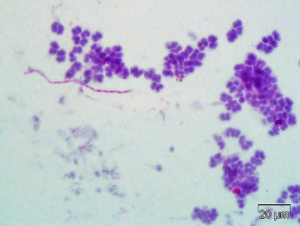 The non-invasive category of fungal sinusitis is defined by the absence of hyphae within the mucosal and other tissues of the paranasal sinuses and includes fungal colonization, fungal ball and allergic fungal rhinosinusitis while the invasive fungal rhinosinusitis is defined by the presence of fungal hyphae within the mucosa, submucosa, bone or blood vessels of the paranasal sinuses. CBI has developed and validated a surgically-induced model of either invasive or noninvasive nasal aspergillosis infection in rabbits. In this model, a fungal infection in the sinus is established and then various modalities for treatment are assessed. Contact us to discuss a scientific study program to fit your Preclinical needs.